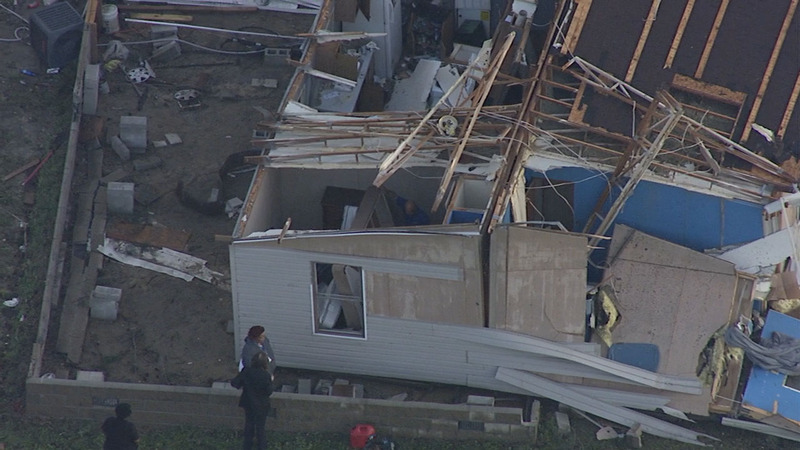 HALIFAX COUNTY, N.C. (WTVD) -- A family is looking for a place to stay after their Halifax County home was hit during Sunday's severe weather. Emergency crews said two people were inside the Enfield home as heavy rain and wind ripped through the area. According to the National Weather Service, the damage was caused by an EF0 tornado with 85 mph winds. Overnight, the home, which is located on Highway 48, was lifted off its foundation. It was partially torn apart and items from inside riddled the front yard Monday morning. Homeowner Brian Richardson said he had been living in the home for more than 20 years. "I'm just still shocked myself," Richardson said. "I was laying right here in the room," he explained. "Next thing you know, I hear a noise sounded like a train." Richardson said his next thought was to check on his mother, who was in a different section of the house. "I'm just glad we're alive," he said. "That's all that matters right now. I'm just glad we're alive. Everything else can be replaced." Richardson said he plans to rebuild his home. A local reverend, who spent the morning driving through the area to check on residents, said he saw the home before the tragic incident. "It's devastating to me to see this house come off the foundation," Reverend Andrew West said. "Nobody got hurt; I thank God for it. That's all I can say is thank God because it could've been worse than what it was."